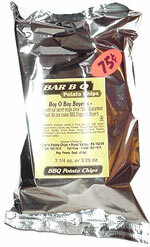 Taste test: Boyer's makes some very tasty wide-rippled chips with a big crunch, and these are no exception. These are very good sweet barbecue chips. They aren't very hot by any means, but they have bit of a hot aftertaste. They start very sweet when you first bite in, but by the time you've eaten several chips, you can taste some heat. Smell test: These have a sweet barbecue smell. Nice.